At Kamigamo Shrine on March 1st, 2014. 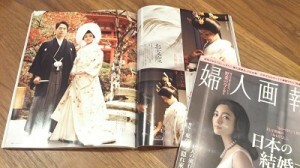 A wedding ceremony supported by LST Tokyo will appear on the June issue of “FUJINGAHO” in a feature article “Japanese Wedding”. The bride wore a wedding costume (kimono) which had been painted by her grate-grate-grandfather, Okoku KONOSHIMA, a famous Japanese-style painter. The wedding costume was worn the last time 67years ago. It looks so beautiful with the spirit of her grate-grate grand father. One of the good things about kimono is that it can be passed down from the generation to generation for long years. Please have a look at the article on FUJINGAHO.